Tuesday’s plenary will be a special conversation with General Colin L. Powell and Dr. Madeleine K. Albright hosted by Esther D. Brimmer, DPhil, NAFSA Executive Director and CEO. As one of the world’s most respected diplomats, Dr. Madeleine K. Albright, continues to advocate for democracy and human rights across the world, while also championing the important impact international relations and educational exchanges have on the United States today. In 1997 under President Bill Clinton, Dr. Albright was named the first female Secretary of State and became, at that time, the highest ranking woman in the history of the U.S. government. From 1993 to 1997, Dr. Albright served as the U.S. permanent representative to the United Nations and was a member of the President’s cabinet. Currently, Dr. Albright is a professor in the practice of diplomacy at the Georgetown University School of Foreign Service. She chairs the National Democratic Institute for International Affairs and serves as president of the Truman Scholarship Foundation. She is also a member of the U.S. Department of Defense’s Defense Policy Board, a group tasked with providing the Secretary of Defense with independent, informed advice and opinions concerning matters of defense policy. 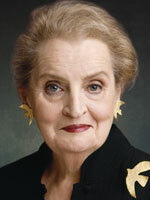 Dr. Albright also serves on the board of the Aspen Institute. In 2012, President Barack Obama awarded Dr. Albright the Presidential Medal of Freedom, the nation’s highest civilian honor. Dr. Albright’s most recent book is the number one New York Times best seller Fascism: A Warning. She is the author of five other New York Times best sellers: her autobiography, Madam Secretary: A Memoir; The Mighty and the Almighty: Reflections on America, God, and World Affairs; Memo to the President: How We Can Restore America's Reputation and Leadership; Read My Pins: Stories from a Diplomat’s Jewel Box; and Prague Winter: A Personal Story of Remembrance and War, 1937-1948. Dr. Albright received a bachelor’s degree with honors from Wellesley College, and master’s and doctoral degrees from Columbia University’s Department of Public Law and Government, as well as a certificate from its Russian Institute. She is based in Washington, D.C.
For over fifty years, General Colin L. Powell, USA (retired) has devoted his life to public service having held senior military and diplomatic positions across four presidential administrations. General Powell served as President Ronald Reagan’s National Security Advisor and he served as Chairman of the Joint Chiefs of Staff for both President George H.W. Bush and for President Bill Clinton. Under President George W. Bush, General Powell was appointed the 65th Secretary of State and led the State Department in major efforts to address and solve regional and civil conflicts throughout the world. He also worked at the forefront of American efforts to advance economic and social development worldwide. 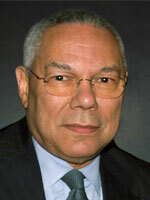 General Powell is the Founder of the Colin L. Powell Center for Leadership and Service at his alma mater, the City College of New York, which has now grown into the Colin L. Powell School for Civic and Global Leadership for which he is the Chair of the Board of Visitors. He is the Founder and Chairman Emeritus of the America’s Promise Alliance, dedicated to forging a strong and effective partnership alliance committed to seeing that children have the fundamental resources they need to succeed. Currently, General Powell is a strategic limited partner at Kleiner Perkins Caufield & Byers, and is on the boards of Bloom Energy and Salesforce.com. General Powell also serves on the Advisory Council of the Smithsonian Institute’s African American Museum of History and Culture. His New York Times best-selling autobiography, My American Journey, has been published in more than a dozen languages. His second book, It Worked for Me: In Life and Leadership, reveals the lessons that shaped his life and career and was an instant best-seller when it was published in 2012. General Powell is married to the former Alma Vivian Johnson of Birmingham, Alabama. They live in Virginia and have three children and four grandchildren. NAFSA thanks Education in Ireland for their generous support.